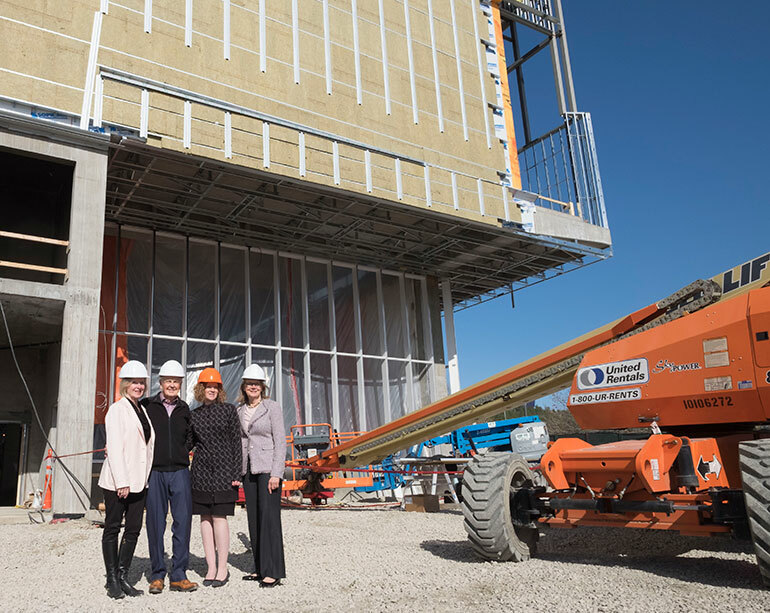 From left: Linda Fitzpatrick, Ross Fitzpatrick, UBC Okanagan Chief Librarian Heather Berringer and UBC’s Deputy Vice-Chancellor Deborah Buszard pose for a photo outside the still under construction Teaching and Learning Centre. UBC Okanagan announced today that the great hall in its new Teaching and Learning Centre building will bear the name of distinguished entrepreneur and retired Canadian senator Hon. Ross Fitzpatrick. Thanks to a donation of $1.25M by Fitzpatrick and his wife Linda, the Teaching and Learning Centre (TLC)—still under construction—will feature an expansive two-storey hall on the ground floor with about 6,400 square feet of flexible, multi-use space. Officially named the D. Ross Fitzpatrick Great Hall, Fitzpatrick hopes students, faculty and staff will refer to it simply as Fitz Hall. The TLC is a $35M addition to the north of the current library building, the most highly used library in the UBC system. Its completion will significantly address the critical need for flexible classrooms and laboratories that support dynamic and technology-enhanced programming, alleviate library overcrowding and respond to students’ strong expression of support. Fitzpatrick credits a student-passed referendum in 2014 to partner with UBC in funding an expansion of the library through their student fees as the inspiration for his own donation. Fitzpatrick has deep roots in the Okanagan and a strong connection to UBC. Born to an agricultural family in Kelowna and raised in Oliver, BC, he completed his Commerce and Business Administration degree at UBC in 1958 and was awarded a UBC Honorary Doctorate in 2012 for his work and contributions to the community. Fitzpatrick began his career when he was appointed research director for the Royal Commission into the Tree Fruit Industry of British Columbia and worked in the industry until he pursued post-graduate studies at the University of Maryland and Columbia University. He later embarked on a journey as a successful entrepreneur, founding businesses in the aerospace, oil and gas, and mining industries across North America. In the 1980s, he returned to the Okanagan to promote value-added agriculture, founding Cedar Creek Estate Winery and pioneering the planting of vinifera grapes in the region for the production of high-quality wine. He served in the Senate of Canada, representing Okanagan-Similkameen from 1998 to 2008 and in 2009 he was awarded the Order of BC. Included in Fitzpatrick’s donation is an additional $250,000 to create the Ross and Linda Fitzpatrick Centennial Scholars Endowment fund. Awards from this endowment will support incoming students who demonstrate academic excellence, leadership and financial need. Special emphasis will be placed on students from the South Okanagan and, through the UBC Blue and Gold Campaign for Students, the Fitzpatricks’ gift to the endowment will be matched by the university. 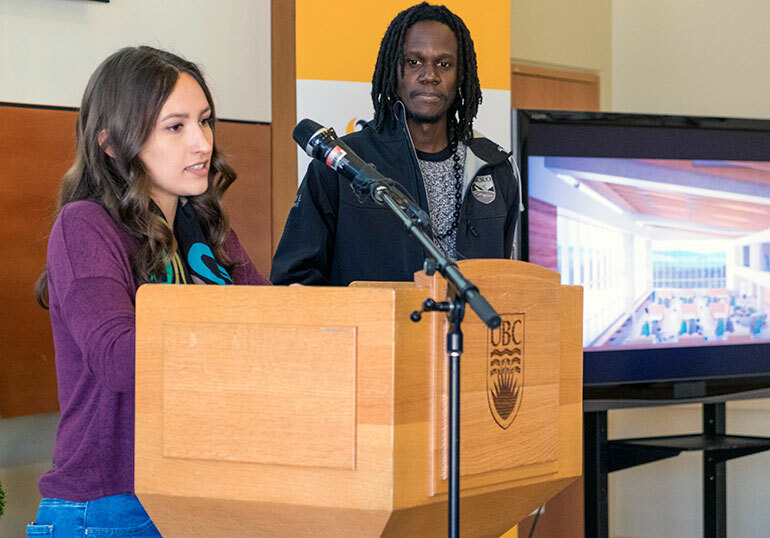 Trophy Ewila, president of UBC Okanagan’s student union, and third-year student Haley Seven Deers provide their perspective on the positive impact the new library space will have on students during today’s funding announcement.